SPACESHIP SIGHTINGS: Would you like a call when the space station is about to fly over your backyard? Sign up for Spaceweather PHONE. NEW SUNSPOT: A sunspot is growing rapidly in the sun's northern hemisphere: image. It appears to be a member of new Solar Cycle 24. Readers with solar telescopes should train their optics on the sun to witness sunspot genesis in action. "I took the picture using a Nikon D3," says Hansen. "It is a 30 second exposure." In some places, rates briefly surged even higher. Robin Busscher reports from the Netherlands: "Between midnight and 2 am, we saw a big show of Geminids with as many as 5 meteors in only 10 seconds. That's even more than the predicted maximum of 140 per hour!" M-P Markkanen of Kuusamo, Finland. "They were all over the sky, sometimes with multiple fireballs within just a few seconds." 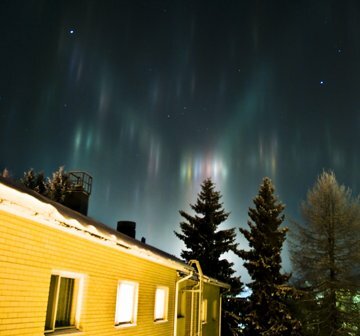 It was an apparition of light pillars, caused by urban lights reflected from ice crystals in the air. 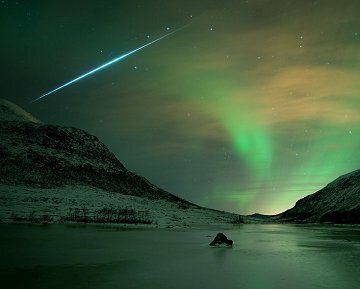 "They danced in the icy sky like auroras as a few Geminids flew past in the background. All in all, it was a lovely spaceweather day!" On December 14, 2009 there were 1086 potentially hazardous asteroids.